My first order of business with this and every product review is a disclaimer: I am not a professional contractor. I am a farmer and a fine furniture maker. When it comes to construction and renovation projects, I’m a DIYer and weekend warrior. That said, I doubt many professional contractors will be reading my tool reviews. My goal in reviewing tools and products is to provide honest feedback based on my own use and experience with these tools to other regular folks like me- wanting to get their hands dirty, try new things, and get the best value for their hard earned dollars. Now, let’s talk about some tools! As is the case with so many Ridgid tools, the first thing I’m drawn to is the price point and the warranty Ridgid offers. It’s ruggedly built, another added bonus around my shop and farm because I’ve got a lot of inexperienced people coming in and out who are really tough on tools. 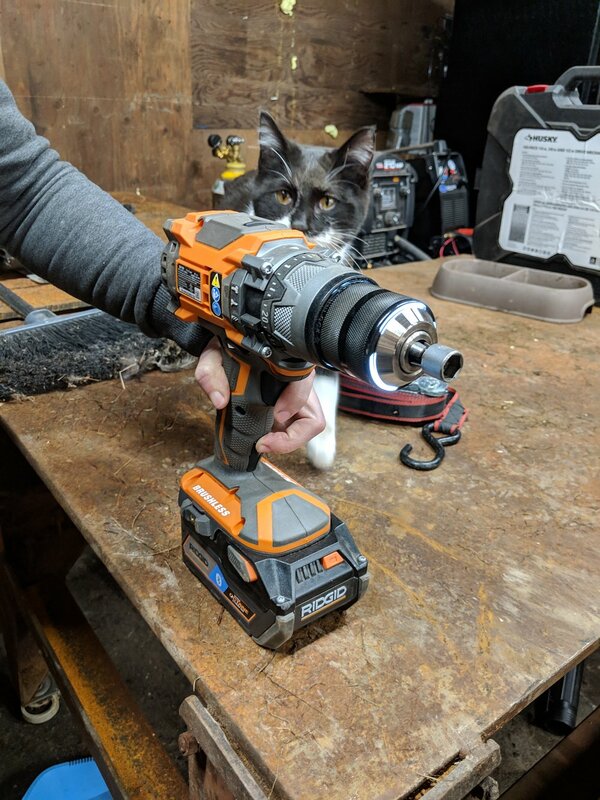 At $149, this is a great value, but I will definitely say that the power this drill offers (1,300 in lbs of torque) begs for a bigger battery, something that would up the cost significantly. If you’re already on the Ridgid Octane platform, you’ve likely already got some bigger batteries, but if you’re not, you’ll want one, and the added cost of purchasing said larger battery might affect your decision making. The half-inch collet is a pretty standard feature on hammer drills these days, and rightfully so, the amount of power, the quick start and stop of the brushless motor, and the cool run cycles on this tool allow you to run some pretty big bits in this drill. This tool also offers a lot of customizability in your drilling and driving functions, with over 100 settings to really help you dial in the perfect setup for the task at hand. One really interesting and unique feature on this drill is the LED light around the collet with an individual trigger just for it. That said, I’ll be interested to see how durable the light is in that position, because I can see it easily getting damaged with a careless drop or slipping off a screw and ramming the head of the driver accidentally into a stud. I also really like the side handle for this tool as well as the way it clamps onto the tool, making the switch from right to lefthanded applications and position changes for tight space considerations quick and painless. The battery level indicator on the battery itself is also awesome, and a feature I really appreciate that Ridgid is including in all their new Octane batteries- no more loading up a toolbag with dead batteries and showing up to the jobsite with no power. My main hesitation with this tool is the ergonomics of the drill. With my small frame, size and heft really become an issue for me hefting a tool for 8 hours. This is a big tool. Yes, it offers lots of power, but with the 2.0 AH battery it comes with, it’s a little unbalanced. With a 4.0 AH battery I stole off one of my other tools, it’s a beast, and for most applications I’m facing, I’d rather have a more compact tool and sacrifice a little power. That said, on the occasion I’ve got light concrete drilling to do where there’s no power source, this would be my go-to option- drilling cinderblocks for joist hangers, hanging expansion bits or anchors in the concrete barn wall, etc. If you’re doing framing, rough construction, or demo, these are the best spade bits for your money. At just under $20, you can expect a lot for your money. The screw style tip pulls the bit right into the wood and it cuts extremely fast. The coating on the bits (the blue stuff) keeps the bit cool while cutting and extends the life of the bit significantly. The curved design of the paddle ejects chips super fast, again, adding speed and keeping the cut cooler. The bits last and last and last, through multiple accidental brushes with screws, nails and staples in framing lumber, but, as I’d expect, they are toast when you hit a big piece of metal. The spiral tip and speed it offers pulls the bits in so fast that it’s tough to have a clean exit hole- something that’s not important in framing, but these definitely aren’t bits for carpentry. That said, it’s advisable to have two sets of bits regardless one for framing and demo, and one for finish work,, because a normal bit is too slow for framing, and the clean cut they offer isn’t really needed for that application anyway. Their hex shank makes them easy to use with an impact, and that’s just another awesome feature. The one thing I will warn with sets like this is that I find myself using one or two sizes of bits for every single application, and then there’s a whole lot of random sized brand new bits floating around in my toolbag. If it were me, I’d be much more inclined to buy a smaller set or multiple individual bits of the size I most commonly use. Posted on January 15, 2019 by Anne Briggs.